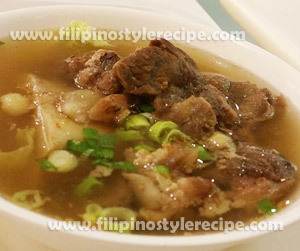 Filipino Style Recipe: Pinaksiw na hito sa soda is another quick and easy fish dish by Filipinos. 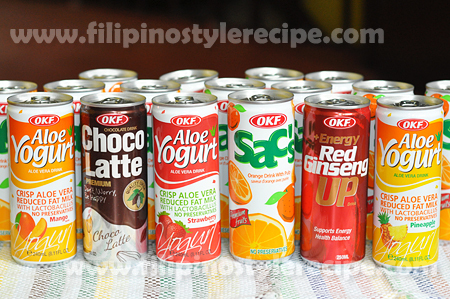 Instead of traditional paksiw which has a sour and salty taste. 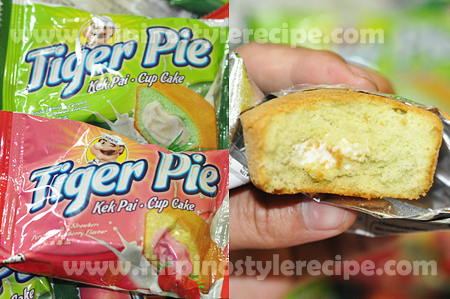 This version of paksiw has an additional sweet flavor coming from soda. 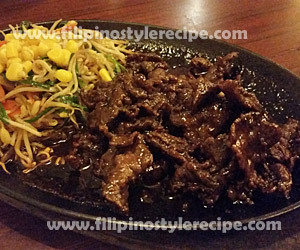 The dish can be served together with steamed rice or sometimes as pulutan(appetizer or finger food) with cold beer. 1. Rub catfish with salt then wash in vinegar. 2. Cut into 3-4 slices then rinse in running water. Set aside. 1. In a large pot, arrange garlic, onions and ginger at the bottom. 2. Arrange sliced catfish then pour vinegar, soda, olive oil, salt and ground pepper. 3. Cover and simmer over medium heat for 8-10 minutes or until the sauce reduced. 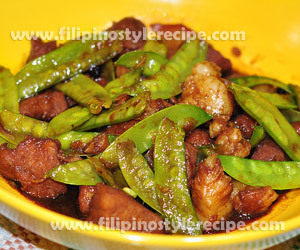 Filipino Style Recipe: Pork Adobo with Sweet Pea Beans is another variety of Filipino pork adobo, we just add sweet pea beans (sitsaro) which gives a contrast color and crunchy texture. 1. In a pot, combine pork, garlic, bay leaves, peppercorns and soy sauce. Marinate for at least 30 minutes. 1. Simmer in a low heat for 40 minutes or until pork is tender. Add more water if necessary. 2. Pour vinegar and simmer for another 10 minutes then season with salt and sugar according to taste. 3. Simmer until the sauce thickens then add sweet pea beans. 4. cook for another 3 minutes then remove from heat. 5. Transfer to serving bowl then serve with steamed rice. 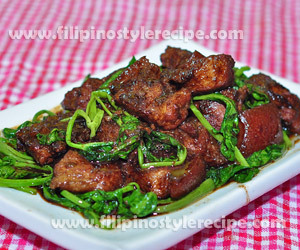 Filipino Style Recipe: Pork Adobo with Kangkong is another variety of Filipino pork adobo, we just add water spinach (kangkong) which gives a contrast color and crunchy texture. 3. Simmer until the sauce thickens then add kangkong. 4. Wait for another minute then remove from heat. 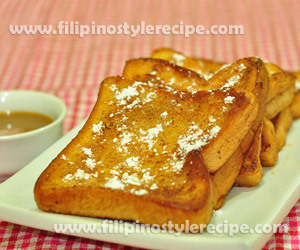 Filipino Style Recipe: Caramel French Toast is a popular breakfast meal that consisting of sliced bread soak in eggs-milk mixture then coated with sugar. Toast with butter over a low heat then serve with caramel syrup. 2. Soak the sliced bread for a few seconds into mixture one at a time then gently turn to coat the other side. 3. Coat with brown sugar. 1. In a frying pan, melt 1 teaspoon butter over low heat. 2. Toast each bread until bottom turns to golden brown then turn the bread over and do the same way. 3. Repeat the procedures for remaining slices. 1. Transfer toasted bread to serving plate, then dust with confectioners’ sugar. 2. 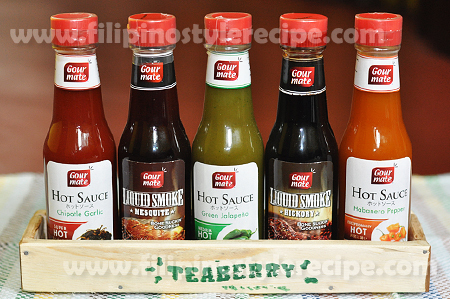 Serve immediately with caramel syrup together with hot coffee. 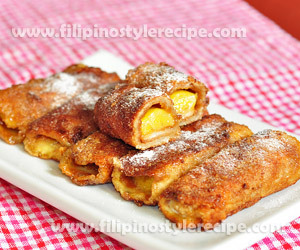 Filipino Style Recipe: Banana Peanut Butter French Rolls is a simple yet special bread dish that can be served together with hot coffee. The bread flatten then fill with peanut butter and banana. Roll then dip in egg and milk mixture. Coated with sugar and cinnamon powder then fry until golden brown. 1. In a bowl, combine sugar and cinnamon powder then mix well. 2. In a separate bowl, combine egg and milk then whisk until combined. 1. Remove the crusts from each slice of bread then flatten with a rolling pin. 2. Fill each slice with peanut butter. 3. Add sliced banana and drizzle with caramel syrup then roll the bread tightly. 1. In a pan, melt butter. 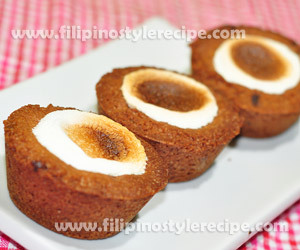 Dip each roll in egg-milk mixture then roll in sugar-cinnamon mixture. 2. Lightly fry each roll until golden brown. Drain. 3. Transfer to serving plate then sprinkle with confectioner’s sugar. serve immediately with hot coffee. 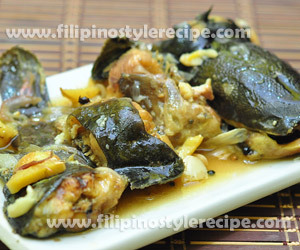 Filipino Style Recipe: Sarciadong bangus is another simple and easy Filipino dish. This dish is a way to re-cooked left over fish. 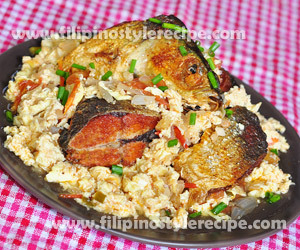 It is usually consist of fried bangus (or Leftover) then cooked in a combination of tomatoes and beaten eggs. 1. Season bangus with salt. Set aside. 2. In a pan, heat cooking oil and fry fish until brown. Drain and set aside. 1. In same pan, reduce the oil then saute onion, garlic and tomatoes until soft. 2. Add water, spring onion, fish sauce and ground pepper. Bring to boil. 3. Add beaten eggs, once the eggs curdles start stirring the mixture. 4. Add fried bangus and simmer for a minute. 5. Transfer to serving plate then sprinkle with remaining spring onion. Serve with rice. Enjoy! 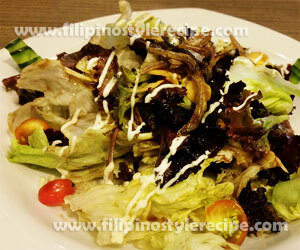 Filipino Style Recipe: Fried Anchovy Salad is a simple and easy yet delicious salad. The sweetness of the dressing and the saltiness of anchovy makes this salad so special. 1. In a large big bowl, tear lettuce into serving pieces. 2. Add the black olives, cherry tomatoes, and cucumber. 3. Add fried anchovies on top then garnish with honey dressing and mayonnaise. 4. Serve immediately as appetizer.